Thea the Thursday Fairy needs her magic Fun Day Flag to inject some fun into the day. But the naughty goblins want to keep it so that they can have fun instead – even if it means swimming with sharks! Great book of the series! I loved them all ! 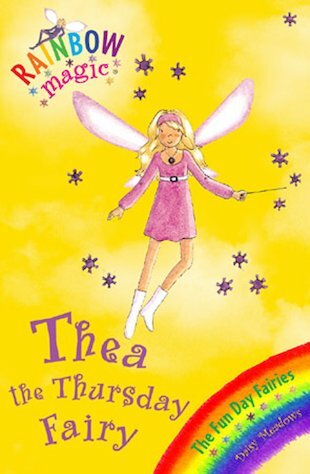 Thea makes sure on thursday everyone in the world has fun. I liked the part whit the seahours. I love when Rachel, Kirsty and Thea go to in the Aquriam aand then go in the tanks to find her Funday Flag. Really Good!